Can artists wake up people to climate change? Let’s hope so, because our politicians (particularly Canadian ones) are doing an abysmal job. Artists have the ability to make an idea spread by giving it tangible form. Unlike the scientist, we artists have the freedom to weave facts, opinions, thoughts, emotion and color all together. We can instill passion and motivate change. Here are three recent examples of artists work on climate change — plus an important invitation for artists everywhere to get involved. Art is about communication. We use art to explain, both to ourselves and to others, what is happening on our planet. Art can change the way a person or a whole society thinks about something. You are invited to participate in a project that is about communicating a number that symbolizes our collective future, and whether we fail or succeed in averting the worst effects of climate change. This number is 350, the number scientist are calling “the most important number on the planet.” 350 represents the safe zone for life on our planet – if we exceed 350 parts per million of CO2 in our atmosphere, we begin to see the negative effects of climate change: the droughts, the floods, the hurricanes and the temperature rise. 350 is a difficult number – to understand, to explain, and to realize what it truly means for life on Earth. Which is why we are calling on the artists, the communicators of the world, to help us to derive meaning out of this crisis, and to share its urgency. We can register climate change with satellites and scientific instruments, but can we register it in our imaginations, the most sensitive of all our devices? This movement needs your help to spread the word, and to inspire people to get involved and take action. Art has always been a major source of inspiration for social movements around the world, and climate change will be no exception. The science is out there, telling us the gravity of this situation, now we need your help to communicate that to the world. We invite you to create a piece of art that can help people to understand what climate change truly means, and 350’s place in that. On October 24th, people all over the world will participate in the world’s largest International Day of Creative Climate Action. This day will be marked by the breadth and diversity of both people and actions involved. We invite you to contribute your creative talents to a local action, and help to make it unforgettable. This would also be a perfect opportunity to coordinate a community arts project, such as a mural or collective “garbage” sculpture, or a land art installation. October 24th is a day to strengthen community, and to show the true creative ingenuity of the human spirit. When you participate, your artwork will be on view for the thousands of people from all over the world who daily visit the 350.org website. There is also potential for your work to be displayed (with your permission) in UN Conferences around the world, including the historic Copenhagen COP15 Conference, as well as international gallery exhibitions, and possibly included in a book or other publications. Please, join us in this global movement, and use one day, or one creation to help us to protect this beautiful, inspiring planet. Together we can. 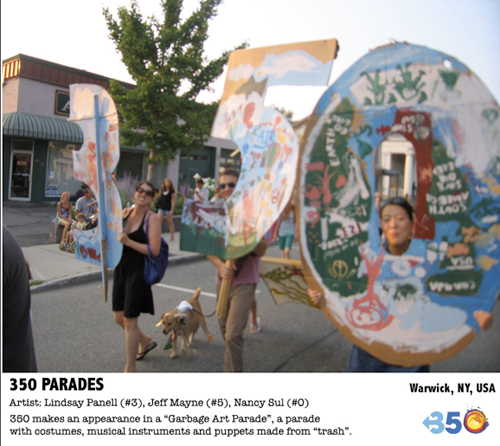 Visit www.350.org/people/art.